Horsefeathers, which is said by "J. E. Lighter's Historical Dictionary of American Slang" to be a euphemism for horse-poop, is reported as being coined by the comic-strip artist and writer, William Morgan "Billy" de Beck. 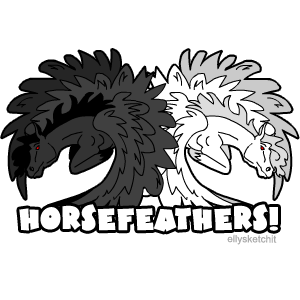 Thus we have Billy & Becky Horsefeathers right here. These pegasus like to get dressed up and have always liked gaudy trappings. They resemble nothing less than a merry-go-round horse when decked out in full regalia. Bill's a good stallion with no sense of direction - he can't even find the stables at night if he leaves a few miles off the Keep -- but Becky's always there to help him out. Unfortunately she's not that able, either, and generally leads him off in the wrong direction.